We just can’t seem to get spring, here, in Minnesota. March started with below zero temperatures, warmed up to the 70’s for a day or two then dropped back down to a dismal, depressing, cold grey. Now it’s snowing. If I could only go to the Islands! Out of the question, but maybe a few Island flavors will brighten up my day, and yours. This is a Sweet Habanero Sauce. As it settles on your tongue, you’ll think “hmm, what’s all this about?” It’s pleasant and beautifully flavored and…sweet. But wait for it! See, habanero can be a bit sneaky like that! The pure, sweet heat will slowly roll across your tongue, front to back, building as it goes. Not that this is overly hot, because it isn’t, with three habaneros, seeded. It’s just hot enough to give you a little tickle and not so hot it won’t be toned down by a little dairy. You can easily adjust the heat with more or fewer habaneros or leave the seeds in for an incredible explosion of flavor. It was my son who clued me into these sweet sauces, similar to one he’s had a restaurant he works at – one of those chain places with loud TV’s, Wings, etc. (Places I seldom venture into willingly.) I’m glad he did, though, because as I was getting ready to make my plain old habanero hot sauce (basically chile and vinegar) I switched direction to surprise him. And surprised myself, too, by how much I like this. A couple batches under my belt, I’ve found myself slathering this on wings or chicken like a basting sauce, using as a salsa or hot sauce, smearing this atop or in quesadillas, dousing egg dishes with it and basically just adding to what ever comes to mind when I’m cooking. It’s fun, it’s fresh and it’s bright, it’s just delicious. I can’t wait to find more things to put it on. Fish tacos, maybe? I think this sauce is beautifully balanced and has a perfect range of flavors just as it is but feel free to find your perfect sauce by tinkering with heat/sweet/vinegar flavors to suit your taste. As I’ve made this, it has almost a ketchup like consistency, but can easily be changed up to a pourable consistency with a little more water and/or vinegar. Try it! I think you’ll love it! Place all ingredients in a small saucepan, bring to a simmer. Cover, turn down heat and cook at a bare simmer until everything has softened, about 20 minutes. Do not be concerned by the “aroma” coming out of the pan; it will taste much different than it smells. Add to a blender (for the smoothest puree) or food processor and process the fruit and peppers are completely smooth. Scrape down the side of the bowl as necessary. If desired, for the smoothest consistency, especially if you are looking for a pourable, not spreadable product, push the sauce through a fine mesh strainer. Fill very clean or sterilized bottles or jars with the hot mixture and refrigerate. This has not been tested for canning, although it should last a good, long time in the refrigerator. Heat: Why burn off only part of your tastebuds? J/k, but the heat can be varied or intensified by adding different peppers for a wider, more complex range of flavor/heat. Fruits: Other fruits may be added, citrus such as lime or orange, papaya, etc. Dried raisins or dates add an earthy, sweet richness. Vegetables: Instead of expensive, tropical fruit, think about using a squash or sweet potato. Onions can bring a bit of a bite to this sauce. Make Spa Water from kitchen waste! Fruit and some veggies – usually goes in Spa Water. This entry was posted in Click here for Fabulous Food Posts and tagged Habanero, Hot Peppers, hot sauce, Mango, Mango Salsa, Pineapple, Salsa. Bookmark the permalink. Wow! That sounds so interesting, and so different! Oh, I love this! It is in my make it list! Oh, I can’t wait to see your version! Don’t get me wrong, I love this as is, but there are so many ways to make this & I’m still tinkering! I was planning to copy this recipe! I have fallen for it! Waiting for a batch of mangoes to ripen a bit. I love using habanero. They have such a better flavor than jalapenos.. I will give your sauce a try. I just canned 30 4 oz jars of habanero jelly earlier this week. Tried some last night on crackers with a little cream cheese. Yum. I hope to sale them at farmers markets this summer. Wow, that’s quite a significant number! It must have been quite a day! I didn’t see it on your blog, but that would be a great post! 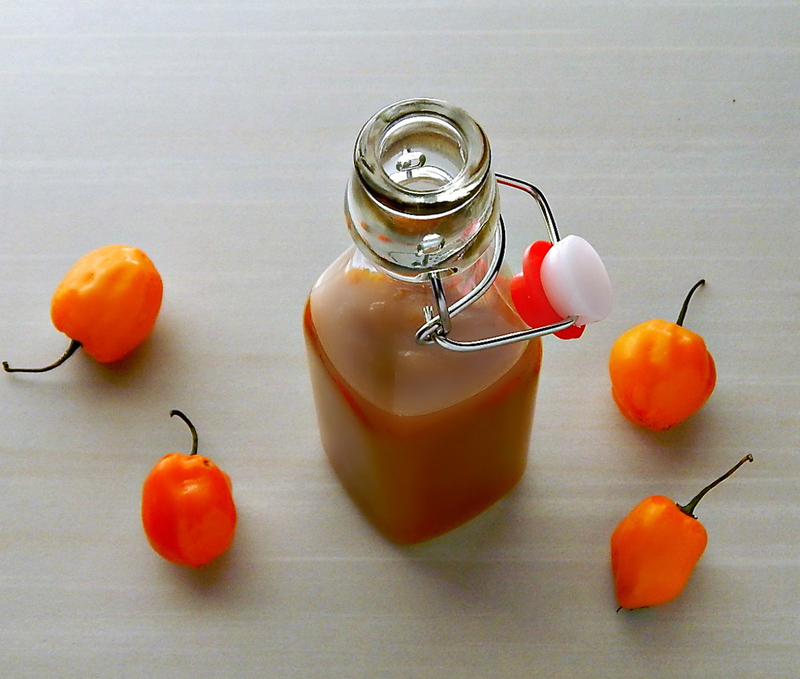 Habanero has such a sweet, fruity taste and I just love the heat! I also made a habanero hot sweet mustard. I will post soon. Yeah my hands and eyes were a little burnt by the end of the day.